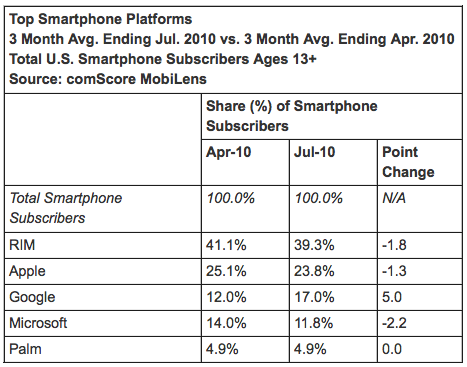 ComScore’s latest US smartphone report is now online. The report clearly outlines as Samsung, the top handset manufacturer grabbing a 23.1 percent market share whereas RIM has topped all smartphone platforms with 39.9 percent market share in the U.S mobile phone industry. The report has been made public which details the main trends which took place in the three month average period ending July 2010. The report ranks the Mobile Original Equipment Manufacturers (OEMs) and the Smartphone Operating System (OS) platforms present in the U.S, according to the market share of current mobile subscribers ages 13 and above. ComScore furthermore revealed that almost 234 million American aged 13 years and above used a mobile phone to communicate. Samsung has been ranked the highest with 23.1 percent followed by LG accounting to 21.2 percent share. Motorola accounted to a total of 19.8 percent share and RIM secured 9 percent whereas Nokia being at 7.8 percent. The report comparing results to the previous Quarter ended, declared that a total of 53.4 million people now possess a smartphone in the U.S. RIM grabbed the top share with 39.3 percent share while Apple was placed second with 23.8 percent share. Android’s market share witnessed an increasing trend with a rise of 5.0 percent revealing a total of 17 percent. Microsoft claimed a 11.8 percent share, coming on the fourth while Palm was seen tagging behind at 4.9 percent. 1. Text Message: 2 out 0f 3 U.S. Mobile Subscribers used it, 1.4 percent higher than the previous quarter. 2. 33.6 Percent users subscribed to the browsing feature. 3. An increase of 1.6 percent in Applications download. A Share of 31.4 percent was recorded. 4. Social networks or blogs were accessed by 21. percent of the audience. An upward trend of 1.9 percent. 6. Online music increased from 13.8% to 14.5%.